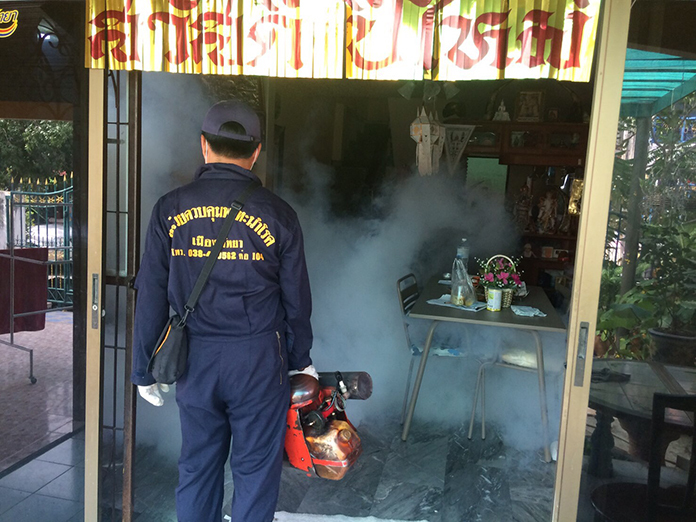 The Pattaya Health Department sprayed pesticide and distributed abate in three neighborhoods at high risk of dengue fever transmitted by mosquitoes. Disease Control Division employees were out Jan. 7 in the Banglamung Post Office, Nong Tabak, and Soi Bongkot communities. They checked for standing water that could be used as mosquito breeding grounds and handed out pamphlets to educate residents on the need to keep areas tidy to prevent the insects from multiplying. The department said Pattaya suffered 362 cases of dengue fever in 2016, with no fatalities. Banglamung District has been declared a “red zone” for the disease and authorities are desperate to reduce the number of cases. Public health officials asked for cooperation from Tambon Health Promoting Hospitals and Village Health Volunteers to handle, observe and closely monitor symptoms of possible dengue patients. Those needing fumigation can call the Disease Prevention and Control Division at 038-253-100 ext. 4081.